Heading into Walla Walla was really exciting, because it was the section of the trip to which I was most looking forward. The beautiful Blue Mountains framed the drive in. 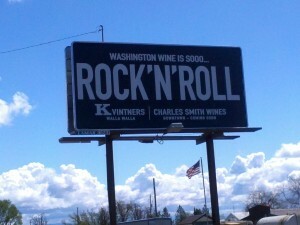 Greeting us was a large billboard from K Vintners and its controversial owner and winemaker Charles Smith. Before entering Walla Walla proper, there is a small town called Lowden. We stopped here first at L’Ecole No. 41. The winery is housed in an adorable French schoolhouse, with the tasting room in a former classroom. The wines being tasted each day are cleverly displayed on an old-fashioned chalkboard. Brandon walked us through a selection of some nice wines. I especially enjoyed their Left Bank Bordeaux blends, the 2007 Estate Perigee – Seven Hills Vineyard Walla Walla (60% Cabernet Sauvignon, 30% Merlot, 10% Cabernet Franc) and the 2007 Apogee – Pepper Bridge Vineyard Walla Walla (60% Cabernet Sauvignon, 30% Merlot, 6% Malbec, 4% Cabernet Franc). These wines are adorned with their new label, a switch from their very recognizable “whimsical” drawing of the schoolhouse. They’ve found a need to make their fine wines look like fine wines on the outside, so they’ve classed up the label with a photo of the schoolhouse taken in 1915, shortly after it was built. Brandon also told us to be sure to stop next door at Woodward Canyon Winery, and I’m glad that he did. Taylor poured us a very nice 2009 Chardonnay, along with a great Walla Walla 2008 Cabernet Sauvignon. The Chard was golden apples and peach in a glass, with just a kiss of oak. I had to get a bottle. I also bought the Cab, which was a Left Bank Bordeaux blend, but with a splash of Syrah added to the mix. It was 77% Cab, with 10 % Cab Franc, 7 % Syrah, and 3 % each of Merlot and Petit Verdot. It had a nice spiciness on the palate, along with some mocha and dark berries. The finish was nice and long. Not only does Woodward Canyon have some very good wines, but a cute tasting room with nice people too! Heading further toward Walla Walla we stopped at Reininger Winery, where Brooke helped us out. She was awesome! We tried some nice wines, including an ‘07 Syrah from their second label called Helix, which was really yummy for the price point of $28. We also tried a fun Southern Rhone blend they call the Helix SoRho priced at $31. My favorite of theirs is the 2006 Reininger Ash Hollow Syrah, with vanilla on the nose and chocolate covered cherries and some coffee on the palate. The finish on this went on for a nice long time. Brooke was born and raised in Walla Walla, and filled us in on a lot of the town’s history. She told us some fascinating tid bits, for example that years ago the residents of the city voted in favor of getting the Washington State Penitentiary to boost the economy and help create jobs. Today it is the 2nd largest prison in the state and is surrounded by wheat fields. Brooke also spent a lot of time giving us all kinds of pointers about places to eat and other info. Downtown was our next destination to grab a bite to eat. We went to Olives, where we each ordered a small pizza. The food was GREAT and so was the atmosphere. The guy who helped us was obviously being trained, but he was awesome. The gal training him wasn’t as nice, but she wasn’t horrible either. It seemed to me that she was more interested in flirting with the new guy than helping hungry customers. After getting some nourishment, we headed to our lodging. We stayed in a LOVELY Bed & Breakfast set smack dab in the middle of some vineyards. This lovely location is exactly what we were looking for. Three glorious nights would be spent here, and we couldn’t think of a better spot. 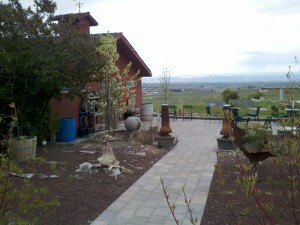 The Walla Walla Inns at the Vineyard is owned by Debbie and Rick Johnson, who also own Walla Walla Faces winery. They left us a bottle of their ’06 Syrah, which was very good. We were sad that we didn’t make it to their downtown Walla Walla tasting room, but will be sure to hit them the next time we’re in town. The only negative about our Inn at the Vineyard was that we couldn’t get Internet access. Rick tried to help us and got his provider on the phone. My husband spent at least thirty minutes on the phone with technical support, to no avail. Rick told us this happens only with Mac users. So, if you use a Mac and need to get some work done, you’ll need to head downtown to their tasting room, Starbucks or Olive to get online. They are working on this problem, so hopefully it’ll be solved in the near future. We were sad to leave the cute little town of Leavenworth, but eager to see what lay ahead. So … off to the Yakima Valley we headed. The drive was another beautiful one. Lots of mountains, river views and windmills paved the way. Yakima itself is just a city. A rather dirty city at that. 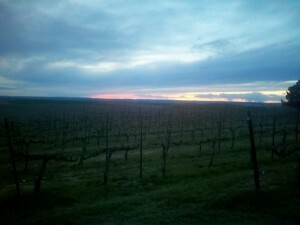 It was great fun, though, to see the vineyard backdrops as we headed to Rattlesnake Hills AVA. The main reason we headed to this particular AVA was because of the day. It was Easter Sunday, and after calling many wineries prior to our visit we found this area to have the most wineries with tasting rooms open on the holiday. Here we hit Two Mountain Winery, Paradisos del Sol, Wineglass Cellars and Knight Hill. Brothers, nephews of the original owner, run Two Mountain Winery. Their wines were good; really good. Their Chardonnay was full of butterscotch with a hint of banana. It was really good stuff, if you’re into big Chardonnay. We bought a bottle! We loved their reds too: good stuff! The guys at Two Mountain told us to be sure to check out a winery not far away, but they were closed. Paradiso del Sol, located just down the road, was open, so we decided to check them out. This is an interesting place. Lots of wines and lots of atmosphere! The wines??? Well, it was difficult to find one to buy. Next was Wineglass. 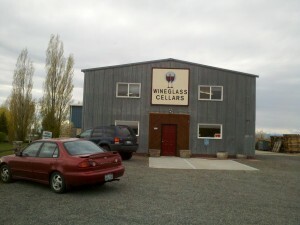 This is one of the friendliest wine tasting rooms I’ve ever had the pleasure of visiting. David Lowe (owner and winemaker) and his wife Linda are absolutely delightful. The wines were good too. Maybe this explains the busy tasting room on Easter Sunday! David brought us (along with the others tasting) into the barrel room for a taste of his ’09 Cabernet, and it was coming along very nicely. His Cabs were my favorite. Our last winery stop of the day was Knight Hill. It was quite the drive, along a long gravel road, but the payoff was good. The wines were really good, and so was the view! They had a beautiful Dry Riesling and a fabulous Mourvedre! Many people warned us that finding a restaurant open for dinner on a Sunday night in the Yakima Valley was next to impossible. Boy, they weren’t kidding. We thought that we’d head to Prosser to check out the area around Merlot Drive, and perhaps grab a bite to eat, but once again they were closed. We ended up driving all the way to Richland, one of the tri-cities. There we found a Courtyard Marriott right on the Columbia River. A short walk away was a great restaurant named Anthony’s. We had a nice dinner with GREAT service. The next day was another day planned for golf, but the rain and wind changed those plans. 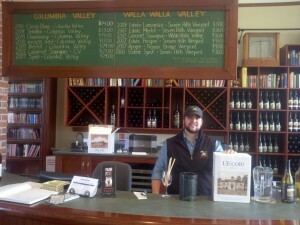 We instead headed to J. Bookwalter, where we tasted with a very knowledgeable and nice guy named Jared. They had a white called “Couplet” which was 60% Chard and 40% Viognier. Wow, was this an interesting wine. I loved it. It was a pear in a glass, with some fabulous clove. The reds were really good too. My husband’s favorite was the ’08 Protagonist and my favorite was the the Conflict! Good stuff! We also stopped back for lunch, which was really yummy, and our server, Majesta, was awesome! The cool thing is, that they also serve some light fare. If you get hungry, and need a little noche during tastings, they serve up some fun flatbread and fondue. Check it out! They’re also open late some nights and have live music! We also hit Barnard Griffin. The wines were pretty good, but the tasting room wasn’t very warm and fuzzy. 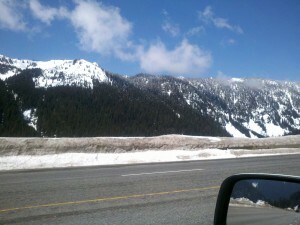 The drive from Woodinville to Leavenworth via Hwy 2 was beautiful. The roads were windy and mostly 2 lanes, with patches of snow in late April. The views were stunning. 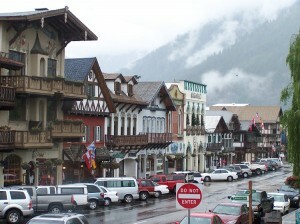 We arrived in the adorable Bavarian town of Leavenworth and went directly to the little downtown area on Front Street. This quant stretch of shops and wine tasting rooms proved to be the perfect spot to spend an afternoon or even an entire weekend. Leavenworth and the surrounding areas have about 15 wineries. Some of them grow their grapes nearby, while others have them trucked in from Yakima Valley and Walla Walla. We decided to start off with a bang and hit the tasting rooms. We tasted at Boudreaux Cellars (in their new tasting room that just opened on April 1st), Ryan Patrick and Kestrel Vintners. Our first stop was Boudreaux, which definitely set the bar high for tasting in this small town. Jennifer was pouring, and she was a delight. We felt very well taken care of as she poured and shared stories of the winery, including the origin of the name. Owner and winemaker Rob Newsom, originally from Louisiana, worked for years with Leonetti. The large number of guys named Rob made it essential to hand out some nicknames, and because of his Cajun roots Newsom was given “Boudreaux” in honor of the infamous Cajun folklore character. When Rob decided to start making his own wines, the winery name was an obvious one! And the wines? Ahhhhh … they are wonderful. I especially loved the ’06 Merlot, which has violets and cinnamon on the nose and lovely smooth tannins on the palate, and the ’06 Cabernet Sauvignon with its smoky nose and fabulously long finish. Our next stop was Ryan Patrick, where they had a nice little red blend called “Rock Island” that doesn’t break the bank. Toni was pouring and she was very nice. Our last wine stop that day was Kestler Vintners. 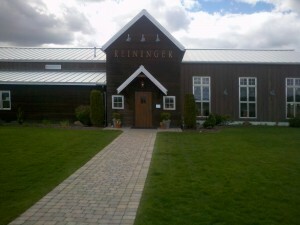 Their wine production is done in Yakima Valley, but they have a nice tasting room in Leavenworth. I was actually pleasantly surprised at their wines. I’ve had their “Lady In Red” line in the past and haven’t been thrilled with them. We tasted a great 2007 Co-ferment Syrah. They’ve blended 7% Viognier with 93% Syrah (done in Rhone style) which adds a nice floral aspect to the nose with violet and lavender, and there is a spice and mocha on the palate. They also have a nice basic Cabernet Sauvignon at the $20 price point. We then headed to Cheesemongers, a wonderful cheese shop where we got to try lots of samples. It was a hard decision of what to buy, but we ended up with 3 to take back to our B&B. We stayed at Abendblume Pension, in their Tannenbaum suite. We had two fireplaces, one gas and one wood burning, a beautiful view and a very comfy bed. 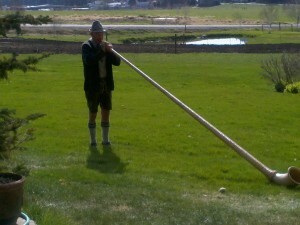 The breakfasts were to die for and on Easter Sunday we were delighted to be entertained by the owner’s father playing his alpine horn. The next day we golfed at a wonderful mountain golf course with spectacular views at every turn. The Leavenworth Golf Club isn’t a difficult course; and can be enjoyed by players of all levels. The first day of our ten day journey through Washington Wine Country found us in Woodinville, a suburb of Seattle. There are many tasting rooms here (due to the close proximity to Seattle’s wine loving population), but only some have their actual wine making facilities here. Most of the vineyards are located east of the Cascade mountains, which we will be visiting later this week. On this day we visited DeLille, Mark Ryan, Ross Andrew and Januik/Novelty Hill wineries. My favorite of the bunch was Mark Ryan. 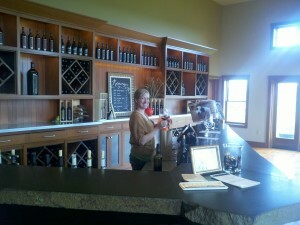 The wines were great, and so was the delightful gal in the tasting room, Kyra. 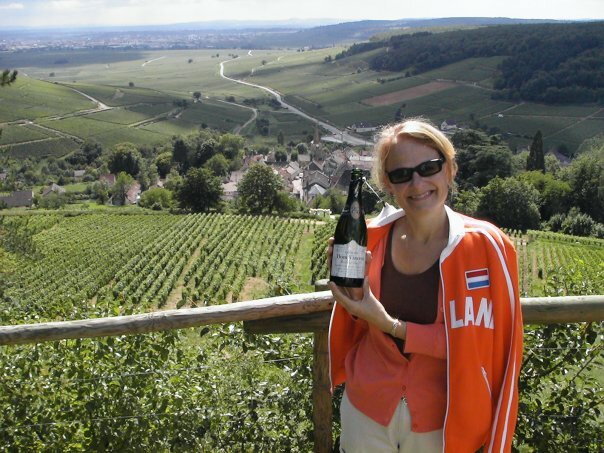 She was really fun and great, but also knew a lot about the wines. We especially loved all of the Bordeaux blends, as well as the Syrah. While there, a nice guy showed up with his dog. This “nice guy” turned out to be Jerry of Guardian Cellars. We would have loved to have tried his wines as well, but he’s sold out! Guess he’s doing something right too. I’ll be sure to check him out next vintage! Ross Andrew (tasting room next door to Mark Ryan) also did a bang-up job. His 2008 Boushe Vineyard Syrah was really tasty, with black fruit and some bacon fat on the palate and a nice long velvety finish. There aren’t a lot of lodging options right in Woodinville. 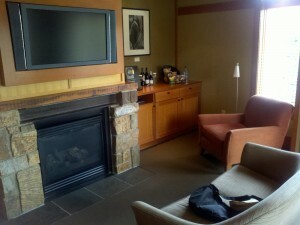 We stayed at the Willows Lodge in one of their suites, which was off the charts amazing. It was truly one of the best rooms in which I’ve ever stayed, and I’ve stayed in some really cool rooms. (We did a last minute upgrade for only $30!) Their restaurant (Barking Frog) was packed and we hadn’t made reservations. The bar was packed too, so we ordered room service instead (which was also from the Barking Frog) and it was awesome! The next day we had lunch at Purple, a great restaurant with a fabulous wine list and Jeff (our server) was beyond great. They have wonderful food and great wines by the glass. After lunch I really wanted to taste at Sparkman, but we were about 45 minutes early. They open at 1pm and we needed to head to our next destination, so we decided to save Sparkman for our next visit to Woodinville. Welcome to the newly launched “Time to Unwine-D Blog”! 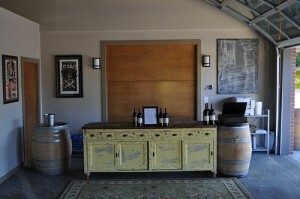 Keep checking back to updates, news, and great things about wine, relaxing, and great ways to vacation in wine country!